So. on the old forum I had a game called the modern game. I'll copy it in here.. enjoy and comment AWAAAAAYYY! For the newest version of the PDF rules, click here. For the original teaser game, basic rules and rules/abilities test, clich here. 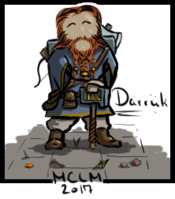 For the signup thread and character descriptions and creation, click here. If you have an idea, suggestions or question, please post them here, here or if you want. PM me. Any help in designing the game, be it the PDF, rules, abilities settings, short stories or the like are more than welcome. Varken is an adventurer. Not in the D&D character sense, he just likes going on adventures. He loves exploring and trying to steal find treasure, and has a tendency to get into situations over is head. Thankfully, he's tough and smart enough to pull himself out of trouble most of the time. He thinks very highly of himself, but instead of using that to justify forcing others to work for him, he takes it as a challenge to always be the best(fastest, strongest, smartest, whatever) which seems to work out most of the time. Varken believes that the problem with this city is a combination of too many rules and regulations(People should be able to fend for themselves) and a lethargy that seems to envelop most of the citizens(What's the point of living if you spent your whole life in front of a T.V.? Go have an adventure! Take some risks!). Varken doesn't really hate the government, but he does think that people who take risks and go big should be rewarded, and that too many rules is stifling(Chaotic good?). Fear: Varken is claustrophobic. Maybe it has something to do with him not wanting to feel powerless? Regardless, he HATES confined spaces. Happy thought: Varken likes spiders. No one really knows why, he just really likes them. He has a pet spider at home. Supernatural beliefs: Varken believes that luck is an important and tangible part of our lives, that luck can be manipulated, and that he himself is pretty lucky. He's skeptical of anything else, but not completely disbelieving. 1st: Determination (4) By declaring to use his three next rounds on one single task, the character gains a bonus to his roll each round equal to 1 at the first round, 2 at the second and 4 at the third round. The character can only stop his task if itÃ”Ã‡Ã–s completed or he is interrupted by an outside happens or person. Extra: Room for improvement (2) This character may have +2 Total abilities. Room for improvement do not count towards the total maximum of abilities, and can be taken multiple times. A tough street brawler, who works on jobs which don't requiere much brain, education or social skills. He has worked as a bouncer, a safety deputy or heavy labor in several factories to earn money so far. He never kept a job for long and only took them on an irregular basis. In the evenings he sometimes fights in illegal fights to increase his income - but he would also do it for free and fun. But most of the time this is nearly enough to covere his bills. He really likes fighting, getting new cool scars and even being wounded, if it does not hinder him. That makes him feel alive. This is his element. One time he was cut across his face buy some a****** who though bringing a knife to an unarmed fight would give him the edge over Jorik. He did cut vertically right over Joriks right eye, but only cutting the skin above and below the eye, not the eye itself. Both ended up in the hospital that day, but the one with the knife in a much worse state than Jorik, who later rightly plead for self defence. He does not like to think and talk much, especially about emotions, relationships, other social things. These are things for girls and a nice family, not a grown up man with such a messed up life like his. And he thinks something is wrong in this world, but is not sure what, because he got not much imagination. He lives in flat share, since he is not at home much anyway. A little room to sleep, a shower, a fridge and a microwave is all he needs. Happy thought: The heat of a fight. Supernatural beliefs: there is no god. He believes in Darwinism and Murpheys Law. 1st: Scared face (-2) Somehow this character have gained a really huge scar in his face, and so stands out in crowds. All other characters uses the higher dice to spot him in a crowd or remember this character. 2nd: Giant size (4) The character gets + 1 to his total life, all roles where size is a benefit he will use the higher dice instead of the lower. Supernatural Beliefs: There may be something out there, with there being weirdness aplenty in the world already, but it's better to look for something with normal logic before concluding anything spectral or magical. Michael has been a private investigator, currently off the job. Given the right motivation, he may accept work, though he's not so motivated for money as for what he feels is just. This said, he still does work for money as needed to get by. While he could have been a police officer, he doesn't deal well with the authority and so prefers to work alone or with a group of friends not in a hierarchy. He knows how to talk to encourage people to give him the information he's after. He's better than average at coming up with creative solutions to his problems. And he's not above breaking the law to get to the bottom of his cases if the need arises. His work has provided him with more than a few bumps and bruises, though it has trained him to notice more of the area around him. To help him keep from getting too damaged, he took an interest in the martial arts, and for a bit of fun, on his off-hours, he's taken to playing hoops. 1st: Martial arts I (3) the Martial artist may treat unarmed attacks as if he was using a blunt weapon. Requires physical 2. 2nd: Attention to details (2) This character is always aware of his surroundings, allowing him to use the higher dice when using his attention and observation to investigate places, people or objects. 3rd: Scared face (-2) Somehow this character have gained a really huge scar in his face, and so stands out in crowds. All other characters uses the higher dice to spot him in a crowd or remember this character. Supernatural Beliefs: The world would be a pretty boring place if there weren't any secret supernatural things, wouldn't it? Jenny looks like a good girl and acts like a good girl, she paid attention in class and didn't get involved with boys or drinking or drugs, she's respectful and kind to her family and goes to church on Sundays. Because that way, no one will suspect her when their grandmother's jewelry goes missing, or the church's donation box is emptied during Mass. She doesn't need to steal things, but she likes to. She's not been caught yet, possibly because she's not tried to steal anything too noticeable or important. But she's got big plans for the future. 1st: Catlike (2) On Physical Rolls involving sneaking, climbing, jumping and acrobatics, the character only uses one dice when not burning stat points. In addition when burning stat points to do this, the character gets a bonus of 1 to his roll. 2nd: Breaking and Entering (3)On Physical involving opening locks, breaking down doors, or other vice breaking and entering the character only uses one dice when not burning stat points. In addition when burning stat points to do this, the character gets a bonus of 1 to his roll. Supernatural Beliefs: The world is out to get him. No exceptions. He believes there is some sort of spiritual element to the world, but is generally a skeptic when it comes to religion or other supernatural phenomenon. Things never quite went according to plan for Daniel. Born to a fairly wealthy family (no connection to the coffee chain), he aspired to become a surgeon from a young age, but his dreams came crashing down when he failed out of medical school. When he attempted to move home with his father, his father was promptly arrested for various ponzi schemes, leaving Daniel penniless and out on the street. After a failed stint as an EMT, Daniel wound up getting caught up with the local gangs, owing money to some very disreputable people. Fortunately, his medical training (finally) came in handy: instead of cash, Daniel wound up paying off his debt through medical services. Afterwards, he started working under-the-table, providing services for those who wanted to stay away from the prying eyes of hospitals and legitimate doctors. He also picked up a firearm, since his clientelle didn't always voice objections through civilized means. Unfortunately, while business was reasonable, his good fortune couldn't last; he came home one night to find his home ablaze, along with most of his worldly possessions. Left with only his wallet, the clothes on his back, and his pistol, he got in contact with a friend to help him find a new place. 1st: Medic I (2) The character has some skill in medical practices. They get a bonus of 1 to first aid Mental rolls. The character is trained in the use of medical and surgical equipment. Requires Mental 1. The character can spend an extra point on this trait to start with a First Aid Kit/Medical Kit. 2nd: First aid (1) The character have attended a standard first aid course, this character can stabilize characters that are below 0 health, as long as their wounds arenÃ”Ã‡Ã–t to severe, to stop the losing of life per round, a Mental roll with the result of 5 or better is required to stabilize a character. Objects characters have one them are Bold underlined, the other things are simply theirs, and are in the closet with a lock one in their rooms (only the characters have the key). Transportation card for train and bus. Map of the city with some of the areas around it. Small, gun that loads 8 shots, 1 damage. 6 Ã”Ã‡Â£lucky cloversÃ”Ã‡Ã˜ of different types. 10 shots for his long rifle. The allied/neutral/enemies are as seen by the players. If the players want some one moved from one status to another they may post so. All the characters moves in. 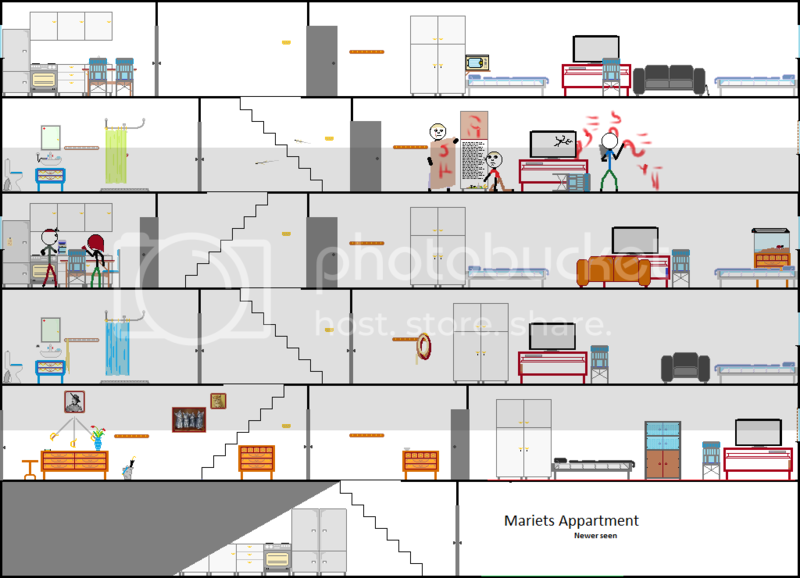 in the start there are some speculation and discussion on who are going to live with who, and if they canÃ”Ã‡Ã–t just rent the 4th floor two. But Mariet wonÃ”Ã‡Ã–t allow it, saying that the room is in bad condition, and that she by the way rents it out on occasion for only short periods of time. no more than two months at a time. In the end; Daniel says that HeÃ”Ã‡Ã–d like to live on the top floor with Jorik, saying he likes the idea of living just under the roof. The others doubt thatÃ”Ã‡Ã–s the reason, but Jorik after a short while says okay, thinking another one to pay the rent might be good, and in the long run, both end up being happy about it. Neither Daniel nor Jorik reaches their dreams. Daniel takes some wrong decisions, ending up losing some money to the wrong people (again) and must work it off just like before, he even gets himself a small gun, just to be one the safe side. Luckily Jorik is a huge help, having a brick wall for a roommate helps keep Ã”Ã‡Â£guestsÃ”Ã‡Ã˜ civilized. He was even kind enough to pay Daniels rent for him, in return for treatment when illegal fights end up badly. Jorik tries as he might, just canÃ”Ã‡Ã–t get into the army. He even got Daniel into doing some small time training with him. But it seems bad luck simply follows him whenever he tries, three times he applies, and three times he have bad accidents happen to him, just before first day. One broken leg, a concussion rendering him unconscious for three weeks and two broken ribs. He never used to get badly hurt before, but luck just isnÃ”Ã‡Ã–t on his side. The third time he rejected his start time, the army wrote back that he was no longer to be considered soldier materiel, and need not apply again. The pro fighting just donÃ”Ã‡Ã–t seem to go his way either, for the same reasons mostly. The only shred of luck he had was finding a long rifle stashed under the floorboards in his room, along with a holy cross necklace. 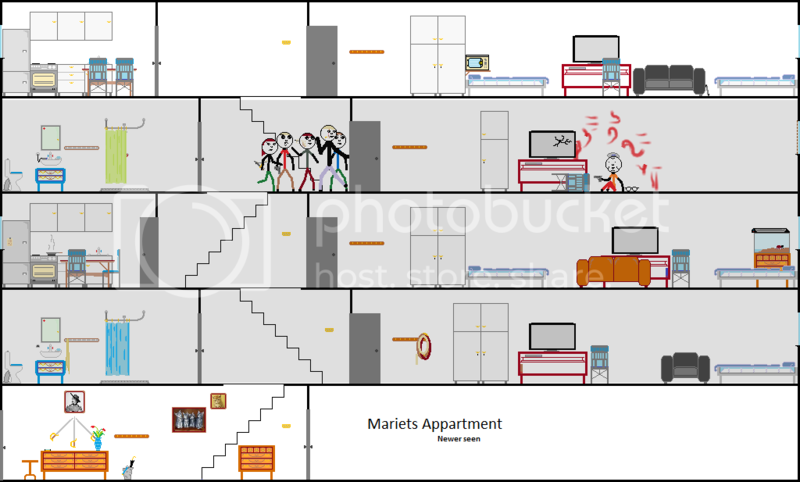 Michael and Varken ends up taking the 3rd floor as their apartment, mostly because Jenny wonÃ”Ã‡Ã–t live with the men, and that miss Mariet insist that it isnÃ”Ã‡Ã–t proper for a young lady to live with a man that is not her family anyways. Not that they have anything against each other, Michael isnÃ”Ã‡Ã–t to happy about Varkens spider, but besides that, they get along fine. The only work Michael really gets is small time cases, with wifeÃ”Ã‡Ã–s cheating on their husbands, who in turn are doing the same on their wifeÃ”Ã‡Ã–s. This on the other hand have given him plenty of time for his own little case, some one year ago, a small Dictaphone suddenly appeared on the TV table in his room. He didnÃ”Ã‡Ã–t think much of it at first, but it just laid there, the exact same spot, unmoved for nearly two months. He decided to ask Varken if it was his, but the only response Varken can give is Ã”Ã‡Â£WhatÃ”Ã‡Ã–s Dictaphone?Ã”Ã‡Ã˜ and when Michael wanted to show him, it was gone. A little over a month ago it then appeared again on the same spot, and Michael noticed this time that it was running. So he decided to buy a camera, and make it record whoever it was that came and apparently reset it once every 19th hour. After one week, he still did not have anything. So he decided to keep it. The fun this is. There are 10 minutes of weird static noise sounds in the beginning, that he just canÃ”Ã‡Ã–t seem to copy or delete from the divice. Varken donÃ”Ã‡Ã–t seem to have more luck than the others, he gets into study really easy, and then his computer breaks down, so he have to wait till he can by a new. Same thing happens again. His adventures are kind the only thing he have, and even those have gone a bit wrong, last time he was arrested two times in a day, and released shortly after, as the police found it wasnÃ”Ã‡Ã–t him they were after. A great storm, of the like that can keep even him indoors have been seen to hunt him the last two months, so he bought a computer again, but most time are just spend talking to Michael. Jenny seemed to be the only one having some luck in her Ã”Ã‡Â£jobÃ”Ã‡Ã˜ actually stealing good things, but staying low enough to avoid police. But just a few weeks ago, karma hit, she had a break in, the thief taking nearly all of her stolen goods, the only things left are a lock pick she stole (handy stuff) and a book. All in all, those who live here seems in bad luck. 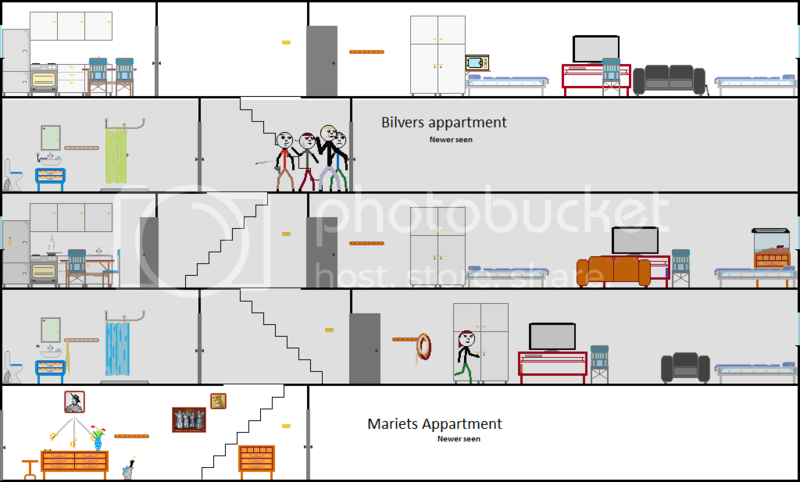 The newest render, A man named Bilver, who have lived here before, some 10 months ago started his stay on the 4th floor by falling all the way down the stairs, then, a week later flattening his tiers on all four wheels of his car, one month ago he lost his wedding ring from his long death wife and one week ago he fell down the stair again, breaking his hips. Or well you donÃ”Ã‡Ã–t know they were broken, but while Jorik lifted him up to his door, Daniel tried to look at him, what he was allowed to see told him it was weary bad, but Bilver was just saying he was fine, only just allowing Mariet to help him in because he was unable to stand on his legs no matter how much he tried. 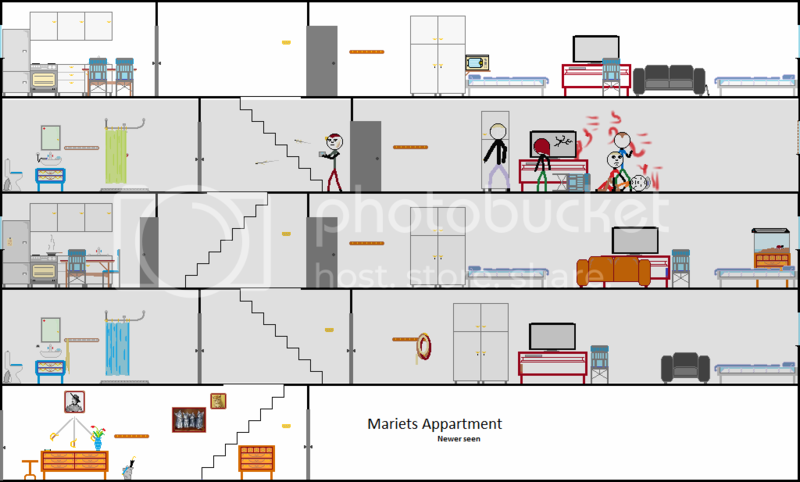 Mariet is an angel, she donÃ”Ã‡Ã–t complain over anything, and even helps the characters when they are all out of luck, allowing them to pay rent to late, waking them up if they are late on job interviews, cleaning the kitchens and bathrooms and even some times making dinner for all of them. Monday 22nd of October. 0630 in the morning. The sound of two gunshots, a door opening and then slamming again and then someone running down the stairs echoes in the apartment. So. This is it.. the game starts here. You cannot see whatÃ”Ã‡Ã–s in rooms you are not in, and things in rooms you know will look just like they did last time you where there, until a player enters the room again, then all changes will be seen. Characters wonÃ”Ã‡Ã–t have name over their heads the whole time.. its just so you can fast see where I have placed them in the first round. Oh.. and do you want sounds writings like in this first image. To help locate sound source/direction? Now.. there wonÃ”Ã‡Ã–t be this much text on other updates, but one thing, please try to keep the players in the same scene.. this do not nessasaraly mean the same picture, but the apartment is only one scene in this case. Just so I can update as much as possible, if there are to much spread out among the players, IÃ”Ã‡Ã–ll keep the important scenes as images and the others as text. Varken- "What the heck! I know the others have shady dealings sometimes, but gunshots? In the middle of the day?...Ah well, we should probably check it out." Varken and Michael moves out to the stairs, here they see Jorik run past the stair well and into the top floor kitchen. Jenny pops her head out of the 3rd floor kitchen-"Was that you guys?" Michael-"The shot sounded like it came from upstairs. At least one of our three neighbors was probably involved, either as the shooter or, I fear perhaps, the target." Varken- "Yeah, it could be somebody coming after Daniel or Jorik, they've had some shady deals in the past. Or, i guess it could be Bilver? He didn't seem that shady, but you never know." Daniel looks out of his door right behind Jorik. Varken can just seem him, holding a gun in his hand. Michael notes two near horizontal **Flee peel marks on the wall of the fourth floor, he is sure they are new. "Daniel, is that you? If you guys are doing target practice, the least you could do is not shoot up the walls!" Just as he says this, the front door slams shot. Jorik, who is now all the way out in the kitchen looks out, only to see Bilver run over to his car and drive away like crazy. Jorik tries to memorize the registration on the car "XQ-4VV XQ-4VV XQ-4VV..." he cant find anything to take notes one, so he runs down to the door to BilverÃ”Ã‡Ã–s apartment. "Put away the gun, it was Bilver and he is gone. He was in a real hurry. Let's check if he did something we should call the police about." He says as he passes Daniel, he also checks his phone, plenty of battery on it. Michael-"It probably happened near Bilver's apartment rather than the bathroom, so whoever attacked was probably aiming for him. Chances are that they knew Bilver, too, as I wouldn't generally give a stranger access to my apartment, not without getting to know them a bit first. Seeing as the shots seem to have come from Bilver's room, it can probably be concluded that whoever did the shooting was there. I doubt he locked the door, if he was in such a hurry to leave, but we can check." Jorik- "Who is they? I only saw Bilver running away." Jenny in the mean time gets down to her room, to fetch her knife out of her closet. "Jorik, did you see whether Bilver was the one with the gun? Also, since when have you watched CSI?" Jorik- "Don't think he had a gun. Not sure though." Jorik did spot some thing in Bilvers hand.. but it might be keys in a golden chain.. heÃ”Ã‡Ã–s not sure. Then he turns towards Varken- "You got a problem with me watching CSI? It was an episode about a marine, ok?" Daniel- "Guys, I think we should call the cops. The shooter could still be in there, if it wasn't Bilver." To this only Jorik reacts, and thatÃ”Ã‡Ã–s with a nod. Michael- "There were only two gunshots, so whoever it is may be bleeding in there taken out by Bilver when the shooter missed twice. Chances are the shooter is still in there, but in what condition is hard to say. Have to say, though, if the shooter is bleeding or dead, then Bilver had some fancy footwork, kind of unexpected knowing him." Jenny-"Ten credits says he shot someone and they're bleeding out in his bedroom. C'mon, we have to check it out." Jorik opens the door, using his foot. Mariet drops the gun and loses conciseness. -Varken "...Okay, this is weird. You still owe me ten credits though. Was Bilver some kind of cultist? Whatever he is, this is really messed up. Further proof that this place is unlucky, I guess. 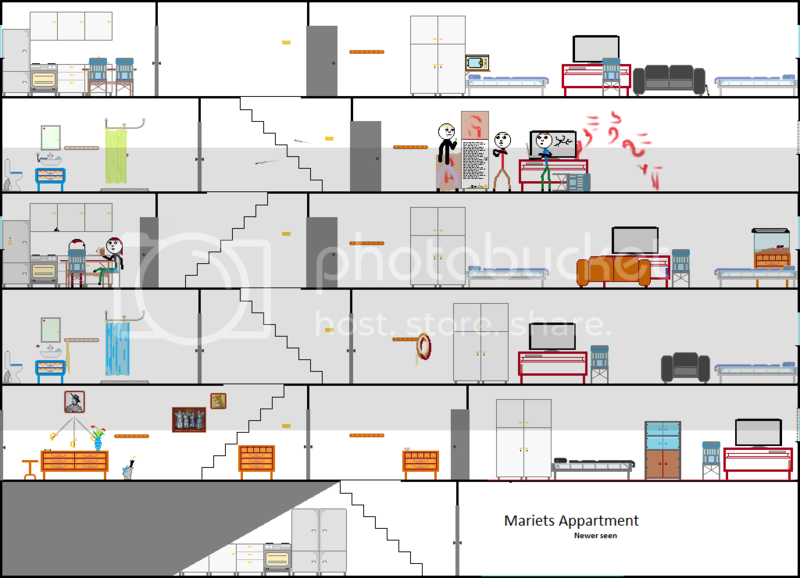 We should take Mariet to her apartment." Jenny-"Her room? We should take her to the hospital!" Jenny looks around, all she can find of interest is 22 credits worth of coins. She stuffs them into her pocket. 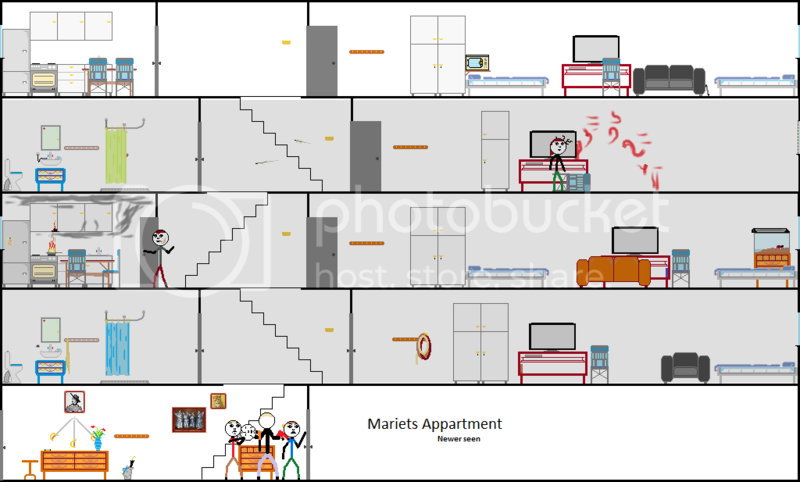 Varken picks up Mariets gun. Varken-"There's nothing wrong with CSI, just never would have expected you to watch a cop show." Michael-"I need to head back downstairs, and take some pictures of this stuff. Unrecognizable writing, the absence of some stuff that should be here, and stuff like that. Bilver seems to have gotten himself into some really strange stuff, that much I can say." Michael then runs down and gets his camara. Jorik- "She needs an ambulance?" Jorik tries to open the closet without using force, but its locked. Michael returns and starts taking pictures of everything. The light in the living room is bad for pictures, but it do workÃ”Ã‡Âª here is his pictures. Unless stolen, your character can always use these pictures. Say if you want to take pictures of something specific. And true, she do find something of inters behind the TV-table, a book, containing only one symbol on its cover, it looks like itÃ”Ã‡Ã–s a monogram, looks like L-O-T-G in some fancy design. Every single page in the book is a blank sheet parchment of what she figures to be pure gold and silver in a weird swirly design. Jorik "Take a look into her pockets, maybe you will find her keys. I can hold her all day but...you know." Daniel, still supporting her weight with one arm, looks through Mariet's pockets for keys with the other. "Hey, Varken. 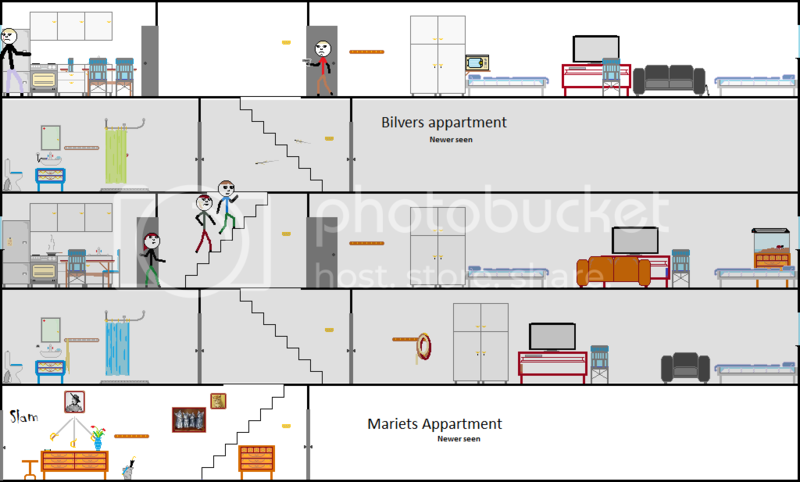 Did Mariet take a trip and fall like Bilver did at some point?" Daniel "I bring it up because it looks like her hip's in bad shape. And Bilver was moving pretty damn fast for someone who cracked a hip not too long ago. Do you think he and Mariet... nah, sorry, that's probably crazy. Nevermind." Daniel seems to be thinking, but stops himself. He just canÃ”Ã‡Ã–t find any keys. Varken continues upstairs. Passing Michael in the kitchen. Varken"Ah, jeez. That's the last thing we need. Burning the house down. Ah well, looks like Michael's got it under control, I'm headed to research those symbols." Jenny gets down and sees why Michael might want some help. Michael, While the fire is currently not a danger, he canÃ”Ã‡Ã–t seem to get it all under control, the pan seems out. But the cabinet keeps burning. Varken gets to his room, opens up his computer, gets to google.. and then he is blank! What kind of symbols were they? Chinese? NoÃ”Ã‡Âª hieroglyphs?... noÃ”Ã‡Âª damn.. what to search forÃ”Ã‡Âª how did they look really? Daniel and Jorik stands a bit at an dead end here. Varken- >Hmm........ maybe I could search for cults or religious groups, and then look for the symbols there? Wait, that's a LOT of smoke. Wasn't Michael taking care of that< he thinks as he smells the smoke, before he can find anything, he is on his way to the kitchen. Michael follows up by taking the pan of the stow, and then the heat off to. Jorik-"Stupid door. Well, let's bring her in." 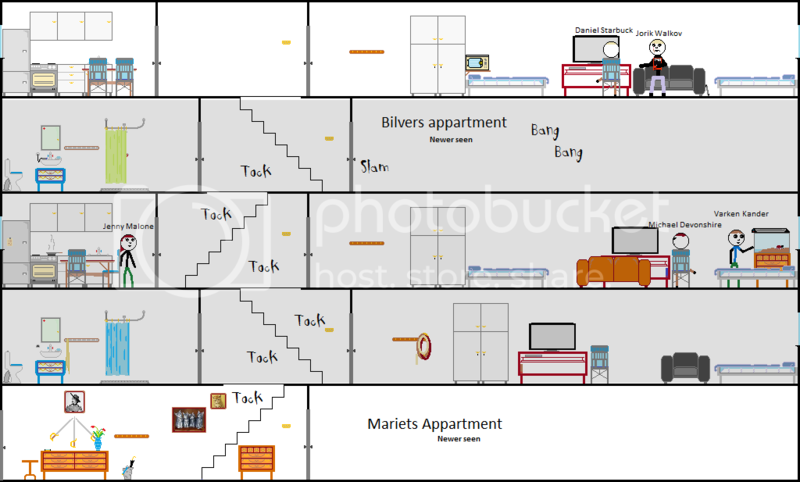 Both Daniel and Jorik starts walking in to Mariets apartment, they notes a bowl of three small amber acorns on the small table in the entrance hall, Daniel canÃ”Ã‡Ã–t help but feeling watched when in the room, so the hurry and brings Mariet into her living room, that is, apparently also her bed room. They lay her on the bed. Mariet, looking a little better- Ã”Ã‡Â£Thanks you boys... if.. if.. you donÃ”Ã‡Ã–t mind, id like some time for myselfÃ”Ã‡Ã˜ she says without opening her eyes... both Jorik and Daniel, while curious as to what this apartment holds, feels compelled to do what she wishes, she is an old lady after all. Ã”Ã‡Â£You know how to call usÃ”Ã‡Ã˜ they both say, not realizing they speak in tone. Then they walk out. Varken-Ã”Ã‡Â£What happens, it smells like This fire was almost out of control! Who was cooking?" he says. Just in time to see Janny and Michael high-five each other. Varken-Ã”Ã‡Â£Yeah, that makes sense. Good job putting out the fire guys, I would have helped, but it looks lye you already took care of it. Anyway, I'm headed to go investigate those symbols again. call me if you need me." Jenny- "Yeah, I was making dinner and I didn't turn off the stove when I came to see what happened. Sorry guys, that was a close one. At least it's out now." Jorik-Ã”Ã‡Â£Who collects acorn seeds? I too build chestnut man, but I was a kid back then. Strange old lady. Also did not expect her to have a gun." Daniel-Ã”Ã‡Â£Wait, you saw them too?" Daniel asks. "So I wasn't just imagining it... They weren't there when we came back out." Daniel says. "Ugh, this whole situation creeps me out." Jenny and Michael stands and makes sure that the fire is outÃ”Ã‡Âª no reason to leave it to burst into flames again.. but it seems to be okay for now. Jorik stands, a bit befabled by what Danile just said. Varken gets back to his computer, searching for cults, mystickes and every other thing he can think of that might have those kind of symbolsÃ”Ã‡Âª but besides from the fact that he have trouble remembering how the symbols looked acutely, he canÃ”Ã‡Ã–t find anything.. 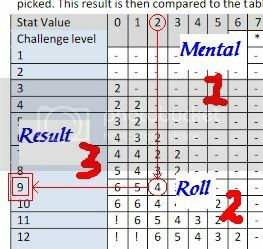 Determination(4) By declaring to use his three nextrounds on one single task, the character gains a bonus tohis roll each round equal to 1 at the first round, 2 at thesecond and 4 at the third round. The character can only stop his task if itÃ”Ã‡Ã–s completed or he is interrupted by an outside happens or person. SoÃ”Ã‡Âª the first round, you get a bonus to your mental equal to 1. So, in your case, it counts as if you have a mantel of 2. You then roll your 2D6 (you rolled 4 and 5 I can see), and since you did not burn any points, your result is 4Ã”Ã‡Âª so.. with a mental 2 and a roll of 4. You can beat a challenge level of 9. Daniel-"Curtains..." Daniel furrows his brow. "The same kind as in Mrs. Mariet's room." He adds, his mind flitting back to his brief moments in her apartment. "Bah. Maybe I'm the one losing it around here..." He starts to head back when he notices the closet again. "Well, if I really am crazy, I might as well do something with it." Grabbing ahold of the closet, itÃ”Ã‡Ã–s a bit unhandy, and guiet top heavy, hard to turn around. Varken shakes his head- Ã”Ã‡Â£EhmÃ”Ã‡Âª sorry, gota go check symbols. Ehm.. fire, jenny, Michal, put out now. Gota go.Ã”Ã‡Ã˜ He says and walks upstairs. A bit confused, Jorik looks into the kitchen, reaches the conclusion that whatever happened, itÃ”Ã‡Ã–s over now, so he walks upstairs. Michael and Jenny- walk around in the kitchen, Michael setting over some coffee and finding some beefs and preparing for dinner. Taking out a new pan in the cabinet above the sink. Jenny-"I wonder how Mariet is now? That was all really weird. Speaking of weird, look what I found..." She takes out the book she found during her search of Bilvers' room. The rolls were good, and it took it as a two part task, turning the closet, and opening it. Being two to open, and Jorik having the benefit of size, that was no problem. -Michal looks at it notes a few things, being an detective with a keen eye for details! First, that all the pages are blank, now, that by it self is not unusual, but they are gold and silver covered, and the book looks like it have been used a lot. Besides that, the leather cover seems unusually soft.. itÃ”Ã‡Ã–s not neither pig, sheep or cow leather. That much he can tell. Varken-"Hmm........looks like these symbols have been used for everything from trying to prove aliens to witchcraft. Well, whatever they are, they're mysterious and linked to supernatural stuff, so that's something to go on." He says, finely snapping out of his computer screen, not able to find anymore on the symbols (Ability effect ended). -Jorik picks up one of the many 4-leafed clovers he can see, this one is all natural, no plastic or anything, but seems fresh. Others are plastic, plastic covered, or even silver and gold covered. There are properly for a nice amount of credits all in all in those lucky charms. Varken-"Hey, look at all this lucky stuff! No idea whether it actually works, but Bilver seemed to believe that it did. Also, maybe these characters will be more useful, i can at least figure out what they say." He says, starting to google translate, first all the words in witÃ”Ã‡Ã–s he knows the letters, then he starts to find the other letters on the net to help him. This will take some time. Daniel- "I guess we're not the only ones who think this place is unlucky. Wow." Michael-"Yeah, that is interesting. Somebody obviously spent a lot of money on this book, and a good amount of time using it even though it's not got anything in it. Perhaps the words are hidden with invisible ink, or something. Not sure what the cover's made of, either, but it's not made of the usual materials. We'll have to look into that as well." Jenny-"I don't know any ways of finding hidden messages but I bet there are some in here. It looks like someone opens this book a lot, so there must be something in here that we can't see." Hay all, thanks for the round. 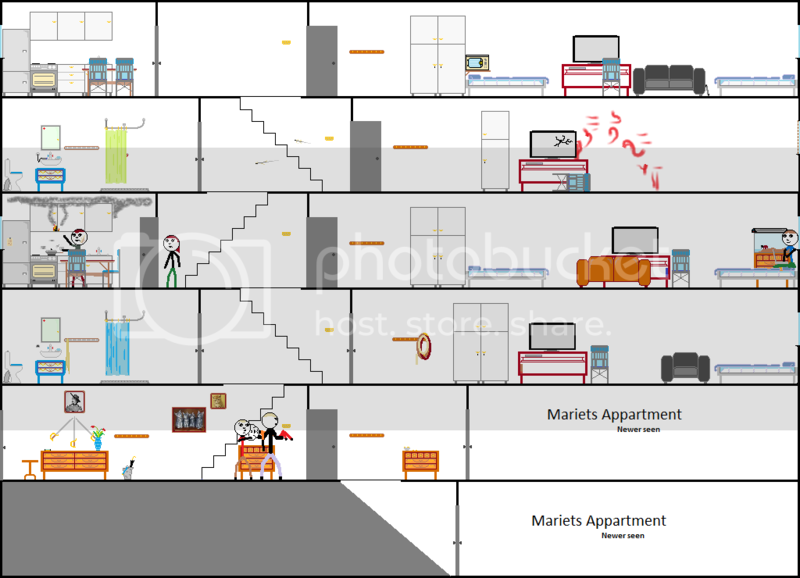 When we change scene, this time, it will be like this. All players regain all stats. I set you a number of possible actions to take, during a period of time, you may suggest other options two if you want. Each player gets to choose 5 options (its possible to do one thing more than once) and make the roll that I tell them is associated with the stat, here also deciding to burn points if they want. I The write the CUT SCENE (a one part scene that do not count towards the total scenes), for that period of time.. this might, might not, include pictures, depends on the rolls and actions taken. At the end of this cut scene, ill reward your players any EXP they have gained, and inform you if you have gained acces to new abilities or templates. You then inform me how/if you want to use any EXP. We talk, discuss if you think you need something I havenÃ”Ã‡Ã–t said. And then I make the first part of the next scene. The last two months have been going more or less without any bad luck, not anything noticeable anyways, witch for all the characters means good luck, only a few things happens, Mariet gets visits from a doctor friend of hers, or so he claims, but he do not look like one, not in Daniels eyes anyways, but he do seem to help, after only two weeks Mariet is up again. While still at helpful as always, she is much quieter now. It seems the shock of Bilvers attack have put a fright into her that she canÃ”Ã‡Ã–t shake, and her mood just seems to stay low. Even working with Michale, Jenny simply canÃ”Ã‡Ã–t find anything of use in the book. The only thing the two have found so fare is that some of the golden pages contains single words, when read in direct moon light. None of the silver pages have shown anything as of yet. For Michael alone the wall symbols just donÃ”Ã‡Ã–t really give anything. There is something wrong with them, so much he knows. But his pictures donÃ”Ã‡Ã–t resemble anything he can find in any books, he just knows something is wrong. Using a lot of time getting around the neighbourhood, Jorik also gets to know a few places that frequently uses bouncers; one place is the riverside hotel casino. Here he gets some few jobs and earns himself a few hundred credits and using some of it himself, but more interesting, to him that is. One day when going home, after a long night with booming music, he decides to explore a bit, the riverside hotel is big, so why not. What he finds is a bit weird there, on the ground in front of the lobby lays an amber acorn, it looks partly melted and the concrete around it is scorched, shortly after, he runs into Varken. Jorik have earned 200 Credits. Jorik have taken some clovers from Bilvers closet. Varken uses much time walking around the city, not much is to be found, and the places he goes seems all like death ends in finding Bilver. But one rainy day, when down at the river side, he sees a man in really expensive close sneaking around, that he is sure he have seen around the house to, might be a former attended, but heÃ”Ã‡Ã–s not sure so he tries to follow at a distance. And there, 200 meters in the direction the man looks, he sees Bilver. Suddenly, there is a crackle of sound, and lightning seems to strike at Bilvers location, the flash is blinding, and when he gets his eyesight back two minutes later, he cannot se neither the man nor Bilver, but he do notes Jorik standing bend over at the same spot the man was, picking something up! Varken also takes an 8-ball from Bilvers closet. Daniel- uses some time to study the text in the closet, being alone doing it, he canÃ”Ã‡Ã–t finish all of the text, but he do get some of it. It seems to be different phrases all involving luck, and all just written out in one, only changing line to make room. He notes that the letters donÃ”Ã‡Ã–t seem to have any connection to the language used, simply, Arab letters are used in Chinese and Hebrew used in Russian, the words only make sense by translating their sound. He also notes that each time the letter is in standard Latin, itÃ”Ã‡Ã–s a new word, and each time itÃ”Ã‡Ã–s in runes, it changes language. This is the luck you have. Luck shall be yours, mine, and ours. Is there more than the lucky few. Bound by luck is abandoned by hope. And the lucky shall fail. Not one shall succeed if I will fail. Be it luck or be it magic, it will be mine. Your ways are undone, lucky as I am. Unmade is the golden garden, the luck of us free. The few shall have it all, such is the luck of the unlucky many. Luck shall turn and be not theirs. Turned are we now, and I am free of your luck. Daniel uses 40 Credits to buy a Medical kit. Now, the fun part: EXP. Play trough the scene 1EXP. Everyone got this. React to danger 1EXP. Everyone got this. Hide from danger 1EXP. No one got this. Who ran away? 1 EXP. Jorik got this. Bring a weapon 1EXP. Jenny and Daniel got this. Care for the elderly 1EXP. Varken, Jorik and Daniel got this. Look again 1EXP. Jenny got this. Attention to details I: ???. No one got this. Attention to details II: ???. No one got this. Attention to details III: Whats that heÃ”Ã‡Ã–s holding?. Jorik got this. Attention to details IV: Are those bullet holes?. Michael got this. Attention to details V: ???. No one got this. Attention to details VI: ???. No one got this. Attention to details VII: Is that blood?. Varken got this. Attention to details VIII: ???. No one got this. Attention to details IX: Is it burning?. Michael got this. Attention to details X: ???. No one got this. Strange things going on I. ???. No one got this. Strange things going on II. ???. No one got this. Strange things going on III. Whats with the hip?. Daniel got this. Strange things going on IV. ???. No one got this. Strange things going on V. ???. No one got this. Now, as you can see, there were quiet a lot of Ã”Ã‡Â£Easter eggsÃ”Ã‡Ã˜ hidden around the apartment. And not all were found, IÃ”Ã‡Ã–d love to give you the titles, but some of them are kind of spoilerÃ”Ã‡Ã–ish, and might still be found so I wonÃ”Ã‡Ã–t. But if you want some of them explained, or think I have missed something that should give EXP. Please do tell. You might notes that I have not given points for neither the door that opened nor the amber acorns, but thatÃ”Ã‡Ã–s because they were seen/done by rollÃ”Ã‡Ã–s and not player attention. RollÃ”Ã‡Ã–s will usually only give exp when hard tasks are completed by using them. No templates have been unlocked as of yet. As told earlier, I wonÃ”Ã‡Ã–t Ã”Ã‡Â£split the partyÃ”Ã‡Ã˜ unless extremely good reason is given. Therefore I give you. 1-	At Mariets apartmentÃ”Ã‡Âª something is happening! 2-	The river side hotel, Varken and Jorik have found something! You may now all vote on the next scene. And you may use EXP before we begin. Next update will not be before the weekend. All stat points have returned. Acorns made of amber, each containing a small dragon fly. In a bowl at the entrance.